Betandskill's Surebet Calculator is a free betting tool will help you calculating level-profit stakes when an arbitrage opportunity exists. It supports odds in decimal format and up to 8 selections. Find here the best free arbitrage calculator tool! As odds of all online bookmakers are different for a same event, there are cases where you can make a sure profit whatever the outcome. Generally, a sure bet appears when bookmakers have different estimations about the outcome of an event. It is vital to calculate very fast the stakes to bet on each selection in order to have the same guaranteed profit whatever the outcome. 2. Enter the total amount that you wish to stake on the arbitrage in the "Total Stake" box. 3. Click the "Calculate Now" button. 4. You will then see how much to stake on each selection in order to have the same guaranteed profit on all the selections. Include? – Check or uncheck these boxes to add or remove additional selections. Eg: for un Under/over bet you need 2 boxes, for an 1X2 bet you need three boxes. Selection – You can add up to 8 selections. 1 & 2 are mandatory, while 3-8 are optional. In a 1X2 bet, selection 1 could represent the home win, selection 2 could represent a draw, and selection 3 could represent the away win. Highest Available Odds – Input here the highest available odds for each selection. 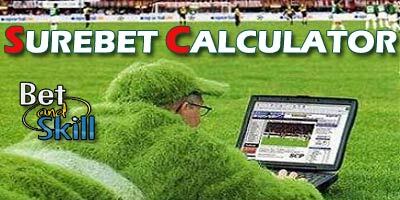 "Surebet Calculator - Free online betting tool for arbitrage"